This book was something new for me: the first time I voluntarily read a book from the business section. But it was well worth my time. The basic premise of Neffinger and Kohut is that influence is based on a balance of two traits: strength and warmth. Too much strength and you elicit fear; too much warmth and you elicit pity. But get the balance right and you have that elusive quality called charisma, and you gain admiration and influence. The authors go on to talk about many traits which can project either warmth or strength -including gender, height, and appearance- as well as specific steps to balance those areas. They also address numerous aspects of both work and personal life, including job interviews, giving speeches, and dating. I’m a manager at my job, so I needed this book. I always thought charisma was something people were gifted with- you either have it or you don’t! – but apparently its a skill that can be practiced. I need to solicit some feedback as to what I need to project more: warmth or strength. But I will start doing charisma exercises immediately! One thing I plan to put into practice is a body language trick the authors recommend. They say to imagine holding a beach ball at the end of your arms- you can make it larger or smaller, and even shrink it to fit in one hand- but it keeps you from hand gestures that are subservient, confrontational and closed. Let the awkward gesturing commence! 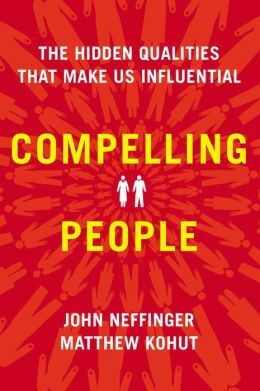 I needed this book in my professional life, but you don’t need to be a manager- or even employeed outside your home- to benefit from Compelling People. I appreciate any and all tools that give me a perspective into the behavior of humans (myself as well as others.) This book opened a window I had never previously looked through. This entry was posted in Non-Fiction and tagged book review, charisma, leadership, non fiction. Bookmark the permalink. Sounds like a great book with useful skills to master. Another one that is incredible on the topic of charisma is The Charisma Myth – Cabane. Thanks for the review!